GD family seems to have more jewels than they're known to have. MT's tiara is one of my favourites, but something confuses me. in others, it looks so light like aquamarine. Are there two similar tiaras or it's just the light? 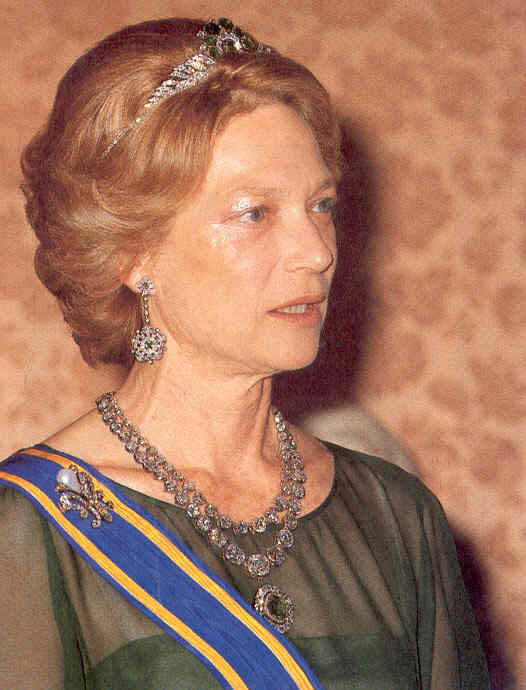 it´s not this tiara that Tessy wear??? Yes I think that's the tiara Tessy is wearing. I found a bigger picture of it. Anyone know what it is called?? I would love to see the jewel vault of the Luxembourg Royal family. Revue is all excited about the Grand Duke. Click Mehr to see photos. "Contrariwise", said Tweedledee, "if it was so, it might be; and if it were so, it would be, but as it isn't, it 'aint. That's logic." There some videos on youtube regarding National Day, you just have to look for them. Naturally the quality isn't as good as those on the official site but they are different. Here is a video of the 2008 celebrations from YouTube. Another one, which shows various members of the GD family in the church, with the national anthem playing. Did'nt see any program yet! I believe it is June 23 is the National Day of Luxembourg, and Prince Louis and Tessy usually attend. Luxembourg's National Day is just around the corner! Please post news and pictures here! I'm excited to see any new pics of the family. We always get excellent pictures of them from National Day. I do hope Prince Felix shows up! I am counting the days to see the whole family, especially my beloved prince felix, is comming soon!! Buth she diddn't know why, or there was a special occasion, like last year in Vianden. I really hope to see Louis, Tessy, and the babies! An artikel in WORT confirms that Guillaume is visiting Esch-sur-Alzette tomorrow, and Henri & Maria Teresa ELL. a question, Felix will be present in any event? Newspapers and official programm tells: "THE ROYAL FAMILY will attend tonight at the "Fakkelzug"
ARTIKEL RTL WITH FIRST PICTURE! It say's FÉLIX is going to ESCH with Guillaume! tomorrow will be featured on the TV channel a interview to Maria Teresa, talking about the programming of the national day.